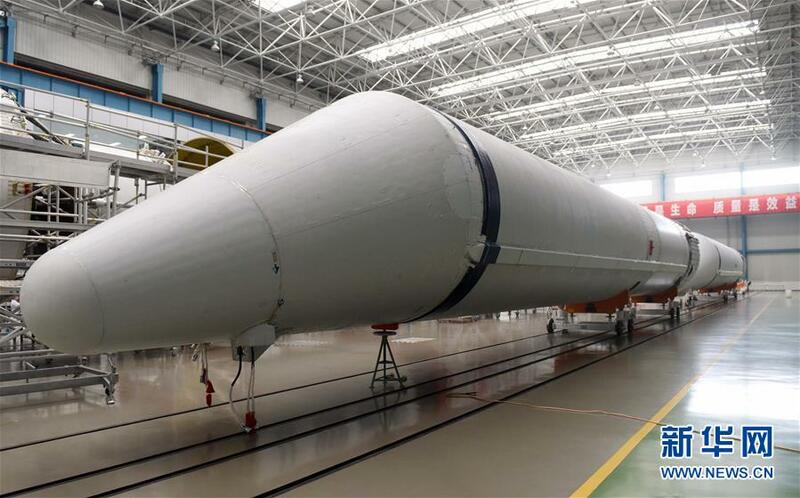 The Long March 5 Space Launch Vehicle (CZ-5) builds the heavy-lift component in China’s new line of rockets introduced in 2015/16 to ultimately replace the country’s current Long March rocket series. Operated alongside the Long March 5 are the medium-lift Long March 7 and the small CZ-6 rockets to cover the entire spectrum of launches ranging from crew and cargo missions to China’s upcoming space station, standard LEO satellite launches and the delivery of heavy Geostationary Satellites. 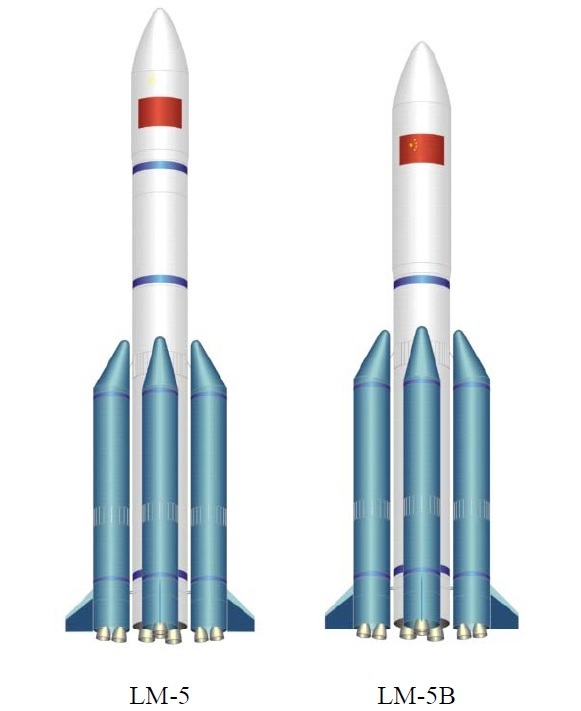 The introduction of the CZ-5/6/7 series marks a major shift in rocket technology as China looks to phase out the CZ-2/3/4 vehicles which rely on a toxic hypergolic propellant combination and, performance-wise, are on the lower edge of what will be needed in the future. The new launchers use modular systems and common components across the different rockets as a cost-saving and simplification measure, allowing a quick build-up of heritage and permitting a streamlined production of launch vehicles to support an ever growing number of missions. 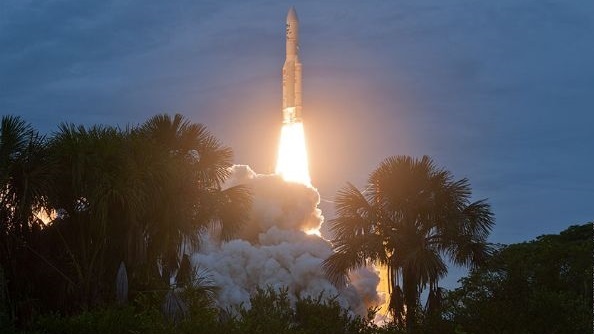 Switching from Hydrazine and Nitrogen Tetroxide propellants to a Kerosene/Liquid Oxygen combination or fully cryogenic stages brings a number of advantages. Aside from their toxic nature, hypergolic propellants achieve a lower specific impulse than Kerolox at a much higher production cost – two very important factors to consider when optimizing the economical aspects of space travel. 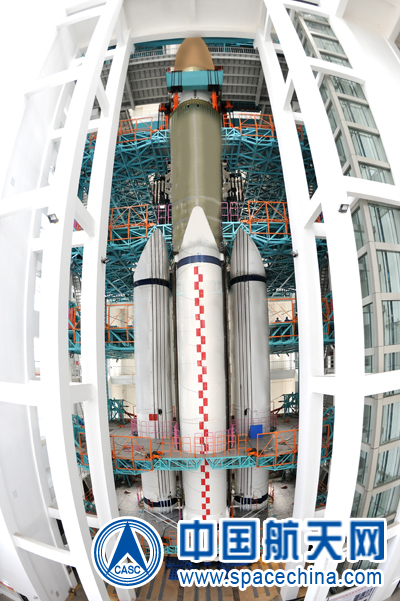 Studies of what would become Long March 5 were first started in the 1990s to develop a launch vehicle to fulfill China’s requirements for heavy LEO and GTO missions over the next three decades. The project was first announced as Long March 5 in early 2001, however, funding for serious development work beyond studies was only made available in 2007. 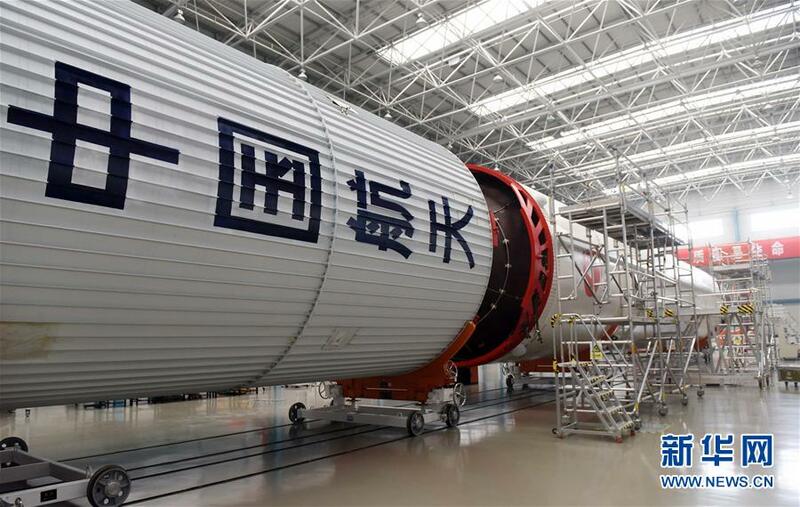 Initially, Long March 5 was envisioned to be a family of rockets – based on modular components – to cover the entire range from light-lift to heavy-lift missions. 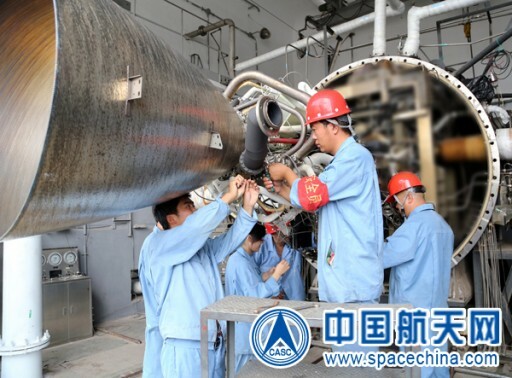 Eventually, development of China’s new launch vehicles branched out to different vehicle classes developed by different institutions but still incorporating a great deal of commonality, particularly in the engine department. From six proposed CZ-5 versions, two went on to enter a development stage with construction of production plants in Tanjin city starting in the second half of 2007. 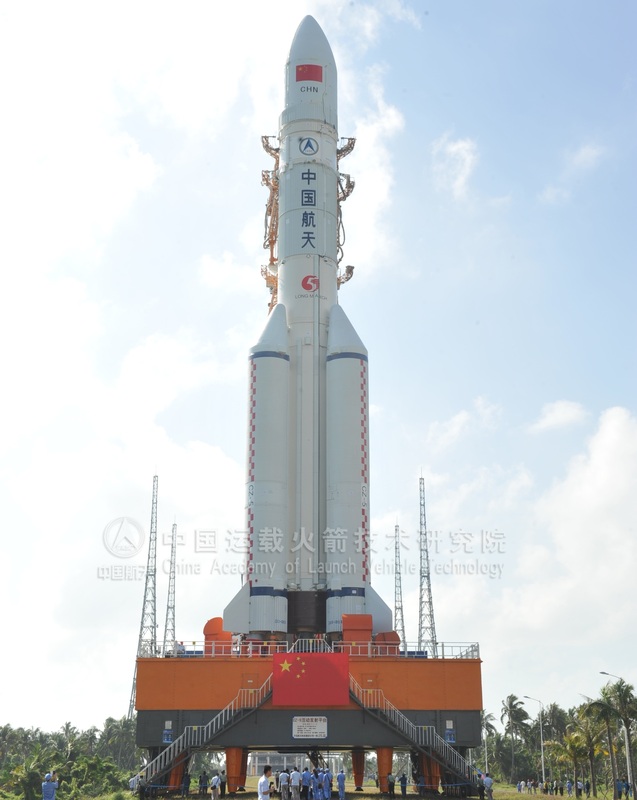 The China Academy of Launch Vehicle Technology (CALT) is responsible for the development of the CZ-5 family. 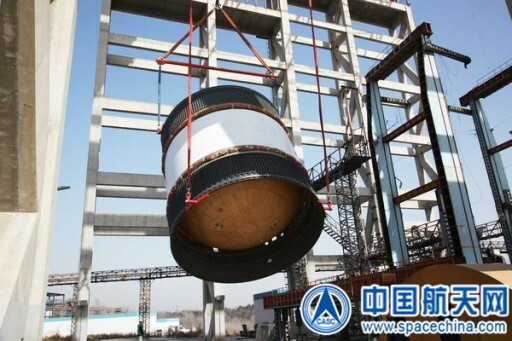 Establishing a production center in Tanjin, a major harbor on China’s east coast, permits CZ-5 rocket stages to be transported to their primary launch site on Hainan Island by ship – lifting limitations on stage diameter associated with road transport. 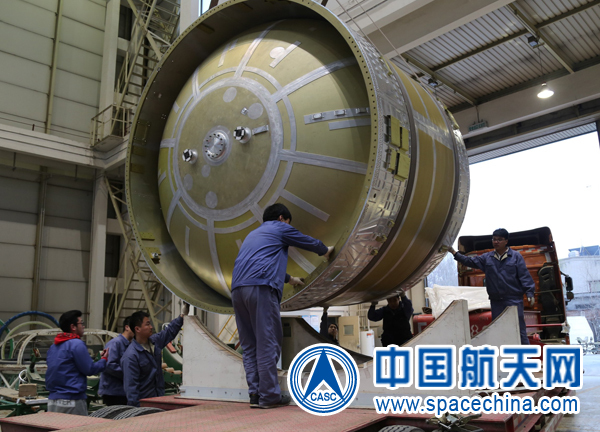 Construction of the production plant was completed in 2012 when the first launch of the vehicle was still expected to occur in 2014 from the new Wenchang Satellite Launch Center. However, the maiden flight slipped to 2016 with the first CZ-5 rocket arriving at the launch site in September 2015 for a series of testing operations involving the vehicle and the new ground support system. The maiden flight of Long March 5 is expected in the second half of 2016. 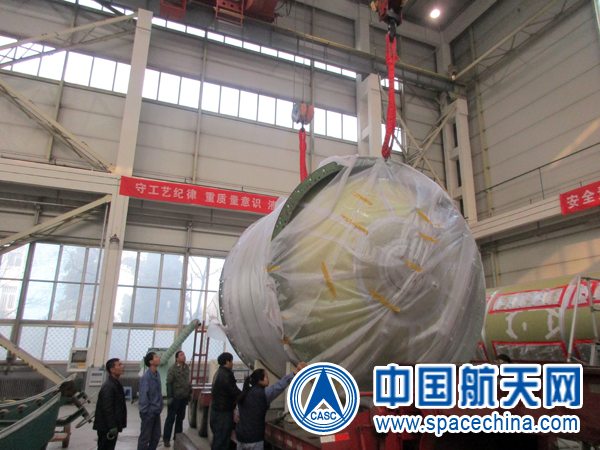 During the development phase, the six proposed variants of Long March 5 were split up to separate iterations of the Long March series with Long March 6 covering light payloads and Long March 7 in charge of the medium-lift sector including crew / cargo launches to LEO. 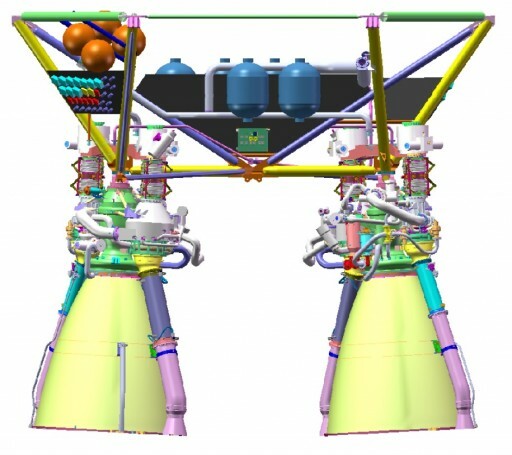 Two of the six proposed versions were not pursued, allowing Long March 5 to become an exclusively heavy-lift vehicle with two different versions: Long March 5 for Geostationary Transfer Orbit missions and interplanetary launches, and Long March 5B optimized for the launch of heavy payloads to Low Earth Orbit such as space station modules. Long March 5 can be operated as a Single-Stage-to-Orbit vehicle when flying in the 5B variant lifting payloads to Low Earth Orbit. 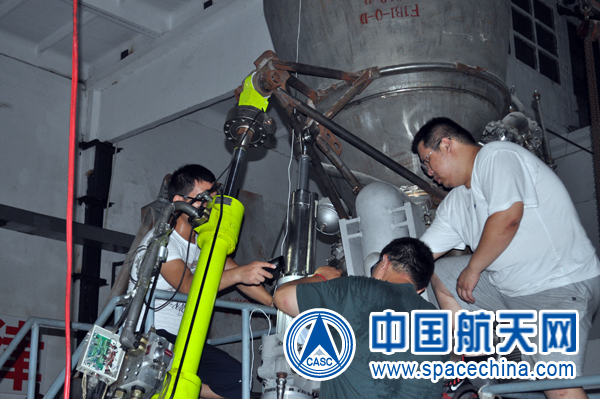 For high-energy missions, Long March 5 flies with two stages plus and optional third stage. The Long March 5B version is based on a 5-meter Cryogenic Core Module (CZ-5-500) with four 3.35-meter CZ-5-300 boosters attached to it. Core and boosters ignite prior to liftoff, requiring no in-flight ignition events and limiting separation events to the jettisoning of boosters and payload fairing and the separation of the payload, an overall reduction of risk. 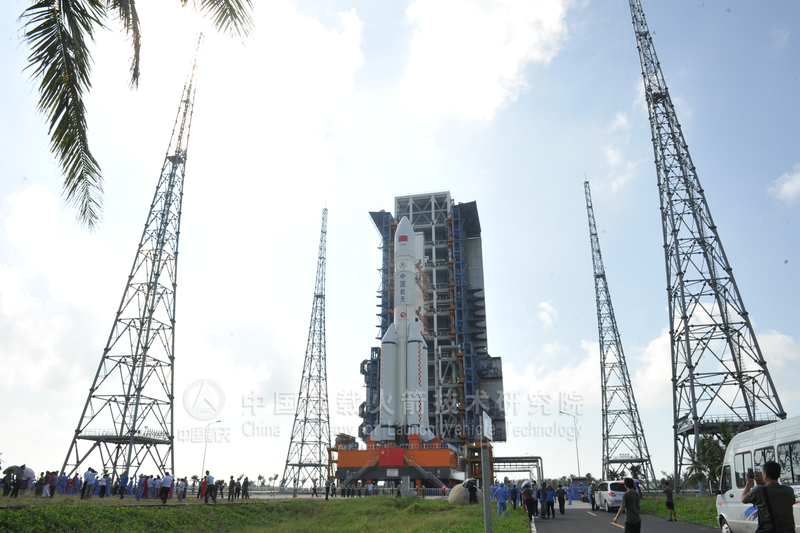 The core stage is powered by a pair of YF-77 engines, an improved version of China’s YF-75 cryo engine in use on the Long March 3 series. CZ-5’s four boosters each host two YF-100 engines that are also employed by the Long March 6 and 7 launchers, increasing commonality between China’s new rockets. CZ-5B stands 53.7 meters tall and has a launch mass of 837,000 Kilograms with a total liftoff thrust of 10,565 Kilonewtons. It can lift payloads of 23,000 Kilograms into Low Earth Orbit (other sources claim a LEO capability of 25,000kg). The CZ-5 variant also employs the CZ-5-500 Core Module and four CZ-5-300 boosters and hence has the same liftoff thrust of 10,565kN. 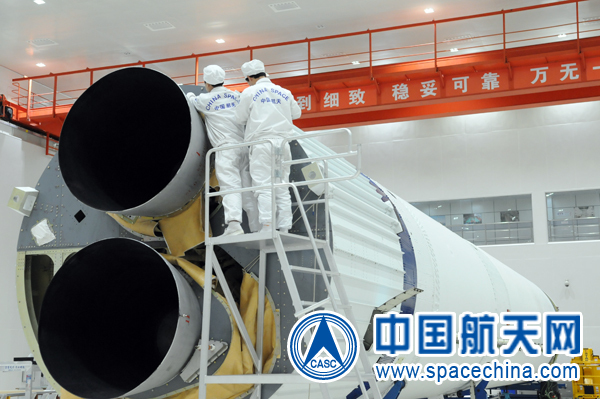 To make it suitable for high-energy deliveries, CZ-5 sports a second stage referred to as CZ-5-HO powered by a pair of re-startable YF-75D cryogenic engines. This configuration will be flown for Sun Synchronous missions and Geostationary Transfer Orbit deliveries. 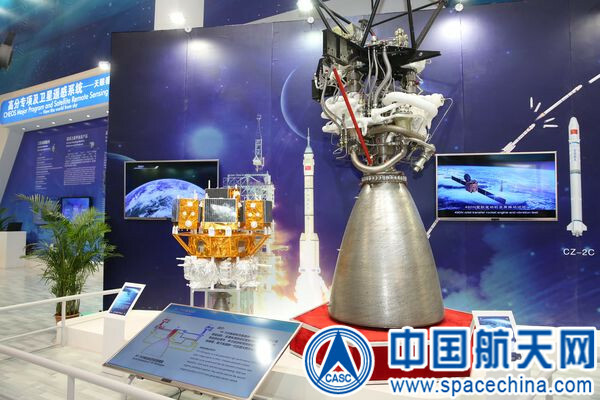 CZ-5 can be outfitted with an optional Yuanzheng-2 Upper Stage consuming hypergolic propellants to enable it to fly long missions to Medium Earth Orbit, conduct direct insertions into Geostationary Orbit and lift payloads to escape trajectories. In the CZ-5 configuration, the vehicle stands 57 meters tall and has a higher launch mass of 867,000 Kilograms. It is capable of delivering payloads of up to 13,000 Kilograms into a standard Geostationary Transfer Orbit (other Chinese sources show 14,000kg). Sun-Synchronous Orbit capability is 15,000kg (700km) to 5,100kg (2,000km). Direct insertions to MEO and GEO are possible for payloads of 4,500kg and 5,100kg respectively. 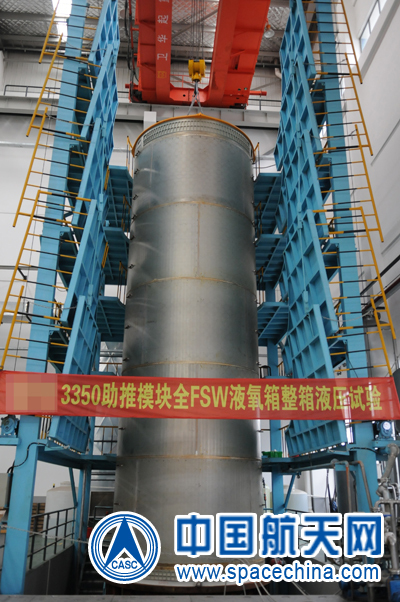 The Core Module of the Long March 5 rocket, known as CZ-5-500, is China’s first fully cryogenic rocket stage developed for use as first stage. Though China had previous experience with the cryogenic third stage of the Long March 3 rocket, the design of the CZ-5 core and its engine system proved to be some challenge. The Core Module stands around 33.2 meters tall and is 5.0 meters in diameter with an empty mass of approximately 20 metric tons. At launch, the Core Stage holds 175 metric tons of -183°C Liquid Oxygen and -252°C Liquid Hydrogen with the oxidizer stored in a tank located above the larger fuel tank. The LOX feed line runs through a tunnel in the LH2 tank to increase packing efficiency. Tank pressurization is accomplished using heat exchangers on the engines to heat up LOX/LH2 creating high pressure gas routed back to the tanks to keep them at operational pressures throughout the burn of the stage. The CZ-5 Core Stage is powered by a pair of YF-77 engines – employing an open gas generator cycle. 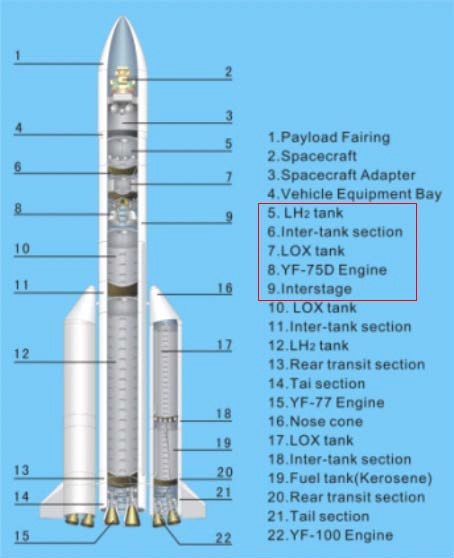 Development of YF-77 presented a rather substantial challenge as China’s previous cryogenic engine development – YF-75 on the CZ-3 upper stage – had to be surpassed by a factor of 9 on thrust, a factor 2.7 on operating pressure and a factor 9 on propellant mass flow rate. 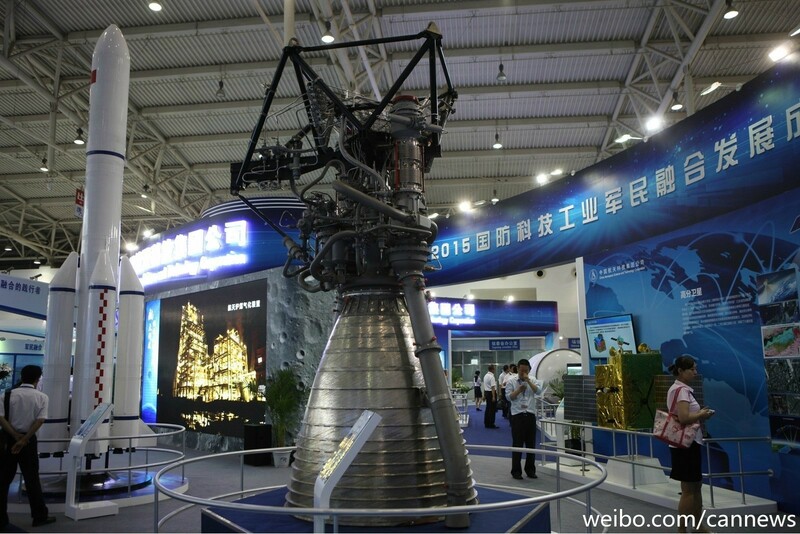 Development of the YF-77 engine was initiated in early 2002 by the Beijing Aerospace Propulsion Institute. Preliminary design work was completed by mid-2002 and the first engine components were produced in 2003 to allow component testing to begin later that year with successful gas generator tests. 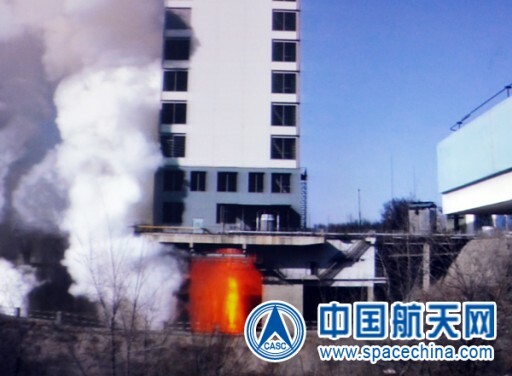 An assembled engine unit began integrated testing by the end of 2003 and the first test firing was completed in September 2004, achieving a 50-second burn duration. Testing under direction of the China National Space Administration commenced in 2005 and took until 2007, allowing YF-77 to enter certification. Qualification testing was started in May 2013 and involved over 70 test firings of 12 engines for a total firing time around 24,000 seconds. Performance and design reviews cleared the engine for integration on the Long March 5 rocket. YF-77 stands 4.2 meters tall and is 1.45 meters in diameter with the two engines installed on a common thrust frame giving the dual-engine assembly a total mass of 2,700 Kilograms. Each YF-77 engine delivers a sea level thrust of 509.6 Kilonewtons at a specific impulse of 310 seconds rising to a thrust of 699.5 Kilonewtons with a specific impulse of 426 seconds. The engine operates at a chamber pressure of 102 bar and the typical mass flowrate is 167.5 Kilograms per second delivered to the engine at a Mixture Ratio of 5.45 to 5.5. The open cycle gas generator scheme was chosen for the engine to create a low-cost but highly reliable engine for application in an expendable launch vehicle. A significant reduction in cost was achieved by employing a pair of moderate-thrust engines instead of developing a bigger engine. The YF-77 combustion chamber is fed by two separate turbopumps on the fuel and oxidizer sides using parallel turbines. Exhaust from the turbopumps is expelled through separate exhaust ducts extending next to the engine nozzle. Engine start-up is achieved with solid-fueled cartridges that deliver a high-pressure burst of gas to start the turbopumps while combustion is initiated within the gas generator and combustion chamber by means of pyrotechnic igniters. Propellant enters the engine through helium-actuated pre-valves. Thrust control is achieved using venturis and dedicated valves are used for fine-adjustments of the mixture ratio to guarantee an optimized consumption of propellants. All valves used for engine start and shutdown are actuated with helium supplied from dedicated helium bottles that are part of the engine assembly. The engine includes heat exchangers to deliver tank pressurization gas during flight. The main propellant valves are ball-type valves located in the high-pressure line between the turbopumps and the combustion chamber. 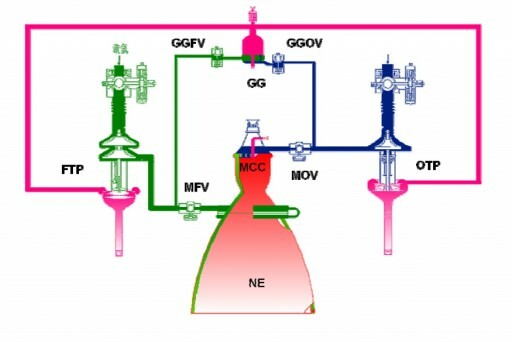 The main oxidizer valve makes use of a two stage design that allows for an initial positioning at 10 degrees during the initial ignition prior to the second stage fully opening the valve for thrust ramp-up. For shutdown, the reverse of this valve’s actuation guarantees safe fuel-rich conditions. Liquid Oxygen ingested by the engine is pressurized by the LOX Turbopump after which 3.4% of the LOX flow is directed to the gas generator while the rest is routed to the combustion chamber. 16% of the pressurized LH2 flow is directed to the Gas Generator while the rest is delivered to a combination of a regenerative and a dump cooling system. 5% of LH2 flowrate is used for the nozzle cooling system which employs dump-cooling – that is flowing hydrogen around the welded pipe nozzle and then dumping it into the engine exhaust stream. The rest of the Hydrogen is passed through a regenerative cooling loop on the combustion chamber and engine throat before being injected into the chamber. The gas generator operates in fuel-rich conditions and splits its outflow 70/30 to the fuel and oxidizer turbopumps. Flow control from the gas generator is provided by pneumatically operated valve systems. The gas generator is comprised of a non-cooled combustion chamber and an injector assembly and operates at a mixture ratio of 0.9, a pressure of 85 bar and a temperature of 900K. 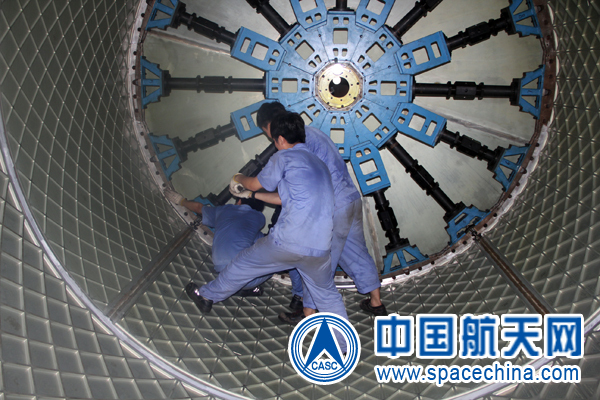 The solid-propellant cartridge employed during engine start is installed vertically in the gas generator outlet. The Fuel Turbopump consists of a two-stage centrifugal pump with inducer and two-stage impulse turbine. The turbopump impellers are made of titanium using a powder metallurgy process while the titanium pump housings use a casting process. For the turbine, an axial design is employed with blades and shroud integrated to the disk made from Indium alloy. Ball bearings support the rotating assembly and are carried by flexible dampers with bearing cooling provided by the flow of hydrogen and lubrication ensured by the choice of the retainer material. At operational conditions, the pump spins at 35,000 RPM and delivers hydrogen at a pressure of 165 bar. The LOX Turbopump uses a single-stage centrifugal pump with a helical inducer that is driven by a two-stage turbine assembly. Lubrication and thermal control on the turbine bearings is provided by Liquid Oxygen while a helium purge supply ensures a cavity is established between the cryogenic bearing coolant flow and the hot turbine gas. The pump spins at 18,000 RPM and delivers an output pressure of 140 bar. YF-77 employs a coaxial injector that facilitates a central igniter tube and baffles which prevent high-frequency combustion instability. The inner liner of the chamber is made of copper alloy regeneratively cooled using the majority of LH2 flow from the turbopump passing between the inner liner and a nickel outer shell. The main combustion chamber has an area ratio of 5:1. A gyroidal tubular nozzle extension brings the engine’s area ratio to 49, chosen to avoid flow separation at sea level while still providing appropriate expansion in vacuum conditions. Propellant utilization is accomplished with a dedicated PU valve sitting on the oxidizer turbine inlet to vary mixture ratio within a narrow band. The YF-77 engines can be gimbaled individually along two orthogonal planes for three-axis control throughout first stage operation. The Core Stage of the CZ-5 rocket operates for around 520 seconds, releasing payloads into orbit at the end of its burn. 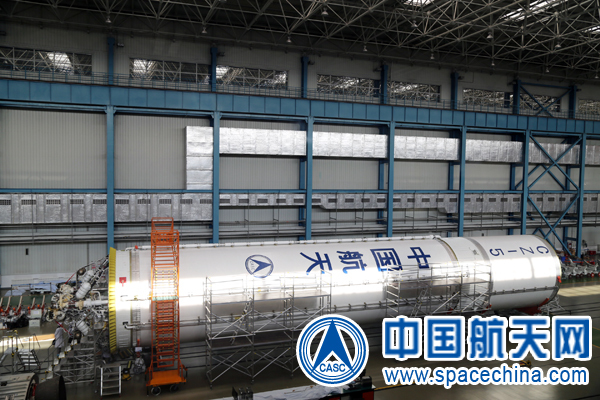 Long March 5 features four liquid-fueled boosters clustered around the large Core Stage. The CZ-5-300 boosters measure 3.35 meters in diameter and stand 27.6 meters tall consuming Liquid Oxygen and Kerosene propellants. Each booster has an inert mass of around 14 metric tons and holds 140,000 Kilograms of propellant at liftoff, consumed by a pair of YF-100 engines that are used across the CZ-5/6/7 launch vehicle series. The boosters employ the common design facilitating the Liquid Oxygen tank above the Kerosene tank with the LOX feedline running through the center of the fuel tank. The LOX tank of CZ-5-300 is around 12.5 meters in length while the Kerosene tank is 6 meters long according to press reports. The boosters are topped by composite caps with a cone inclination angle of 15°. 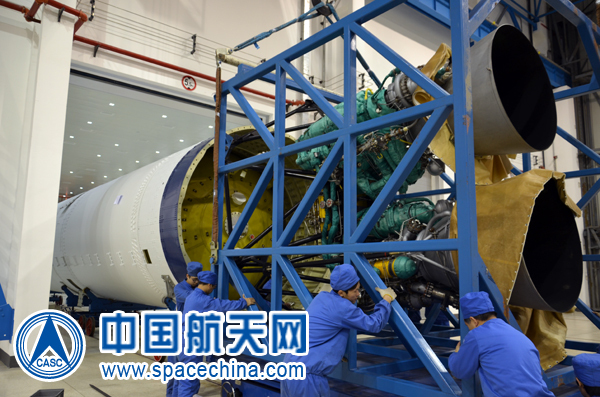 A modified version of the boosters with only one YF-100 engine is in use as the first stage of the light-lift Long March 6 vehicle. The CZ-5 boosters are powered by a pair of YF-100 engines which are individually gimbaled to provide three-axis control to the vehicle. YF-100 is a high-pressure staged combustion engine employing an oxygen-rich preburner that generates hot, high-pressure gas by burning a portion of the fuel inflow in an oxygen-rich environment to drive the turbine of the oxidizer and fuel turbopumps that use a single shaft and deliver the propellants to the combustion chamber of the engine. The boosters fire for approximately 170 seconds and are separated by pyrotechnic devices. A clean separation is ensured by two pairs of solid rocket motors in the forward and aft sections of the boosters pushing then outward from the core stage. The CZ-5 version, optimized for high-energy launches, employs a second stage that shares the Core Stage’s 5-meter diameter. 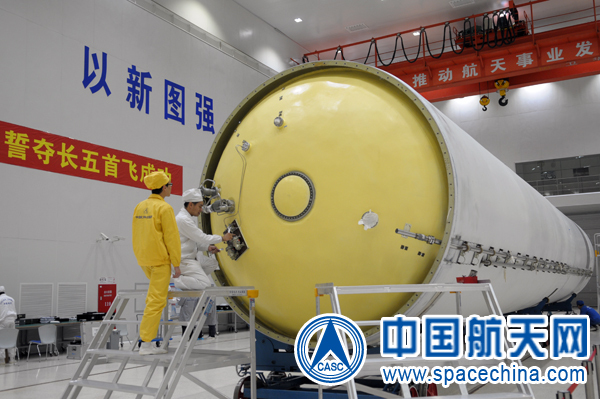 The re-startable upper stage resembles the design of the Delta Cryogenic Upper Stage in that it has different tank diameters for its oxidizer and fuel tanks with a truss structure connecting the two. 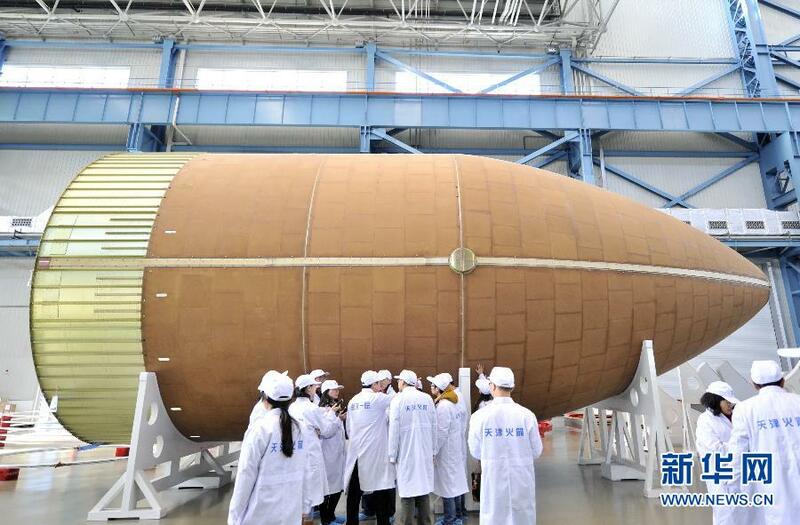 The HO second stage is around 11.5 meters long and has a maximum diameter of five meters on its Liquid Hydrogen tank. The smaller LOX tank, with a diameter of less than four meters, is located under the fuel tank and resides within the interstage section connecting the Core Stage and second stage. CZ-5-HO has an inert mass of approximately 3,400 Kilograms and carries 26.5 metric tons of propellant burned by a pair of YF-75D engines. 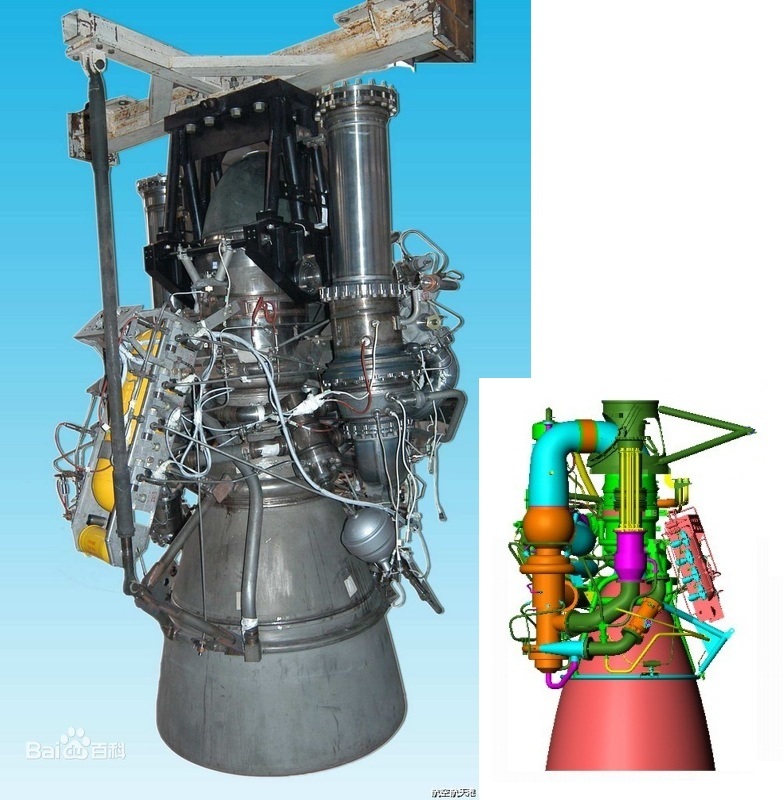 YF-75D is China’s third generation upper stage cryogenic engine following the YF-73 developed in the 1970s and its direct predecessor YF-75 in use on the upper stage of the Long March 3 series. Compared to YF-75, the YF-75D version offers a slightly higher thrust and specific impulse and has the ability to conduct multiple in-space re-starts compared to the single re-start the YF-75 can support. Like its predecessor, YF-75D is a closed expander cycle engine in which the fuel is used in a regenerative cooling circuit around the engine chamber and nozzle causing it to change phase. The gaseous fuel is then used to drive the turbopump turbine(s) before being injected into the combustion chamber. YF-75D delivers a vacuum thrust of 88.26 Kilonewtons at a specific impulse of 442 seconds. The engine has two turbopumps driven in series by the expanded hydrogen gas delivering propellants to the combustion chamber at a 6.0 mixture ratio. Mixture ratio adjustments are possible within a narrow band to optimize the consumption of propellants. Taking the YF-75 as a basis, designers modified the combustion chamber and nozzle to keep the power balance of the expander cycle – requiring the thrust chamber to be lengthened and the cooling channels to be redesigned to ensure the heat-transfer performance required by the higher power setting can be achieved. YF-75D employs an axial-flow, two-stage turbine to drive the hydrogen turbopump at 65,000 RPM. The redesigned pump rests on dual elastic metal dampers around ceramic ball bearings. The engine operates at a chamber pressure of 41 bar and has a nozzle ratio of 80, optimized for operation in the vacuum of space. The two YF-75D engines are installed on a common thrust frame and each can be gimbaled by four degrees along two orthogonal planes to provide three-axis control during operation. YF-75D has demonstrated up to eight engine re-starts during ground testing, enabling it to support complex mission profiles. Engine start is achieved by allowing hydrogen at tank pressure level to enter the engine, run through the cooling circuit and expand, thus beginning to drive the turbopumps followed by the ignition of the propellant mix in the combustion chamber. To support coast phases needed in Geostationary Transfer Orbit missions and all other high-energy deliveries, the second stage of the CZ-5 is outfitted with a reaction control system. However, no details on the system have been published to date. The CZ-5 variant can be outfitted with an optional Yuanzheng-2 Upper Stage to complete high-energy deliveries or complete extended missions – e.g. to Geostationary or Medium Earth Orbit. Yuanzheng-2, YZ-2 for short, translates to “Expedition-2” and is a new liquid-fueled upper stage design representing a larger model of the YZ-1 introduced on the Long March 3 series in 2015. 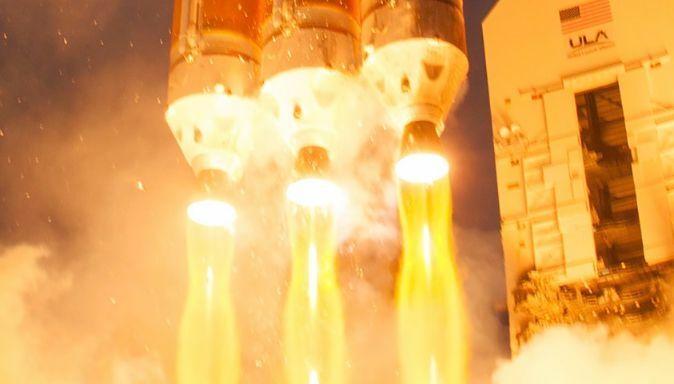 It provides precise insertion capabilities into a variety of orbits, expanding the capabilities of the current launchers, of which, some can only fire their stages once which previously required payloads to carry heavy propulsion systems. YZ-2 is capable of making multiple burns and can deliver multiple payloads into orbit that no longer require individual apogee-raising systems. 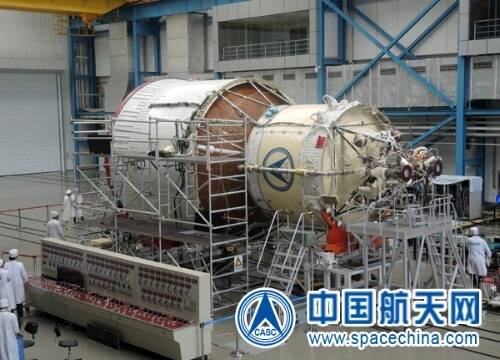 China had previously used solid-fueled apogee kick motors that were able to do the job just fine, but lack the precision and re-start capability of liquid-fueled upper stages. From a performance point of view, YZ-1 can be compared to the Russian Fregat Upper Stage that is often used on the Soyuz rocket to deliver a range of payloads to orbit including Europe’s Galileo Navigation Satellites. YZ-2 is slightly larger than YZ-1 and sports a pair of YF-50D (150) engines instead of a single powerplant. The engines use storable propellants, Unsymmetrical Dimethylhydrazine as fuel and Nitrogen Tetroxide oxidizer. YF-50D (150) delivers 6.5 Kilonewtons of thrust (663 Kilogram-force) at a specific impulse of 315 seconds. It is capable of performing at least two engine burns over a mission duration of 6.5 hours to facilitate an insertion into a Geostationary Orbit or other types of high energy orbits. 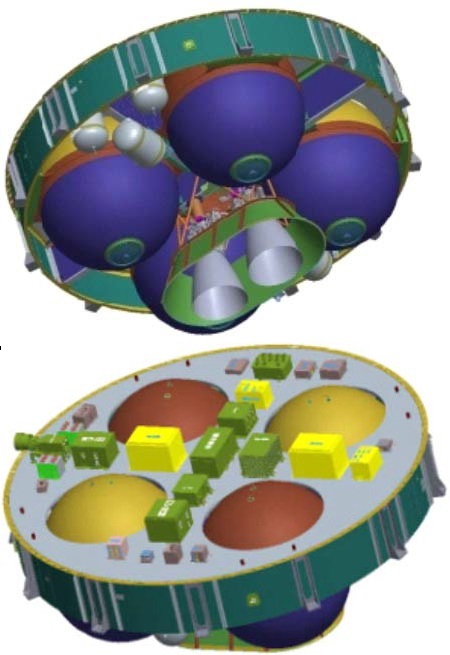 YZ-2 features spherical propellant tanks, pressurant bottles, an inertial navigation platform, communications systems and a attitude control system consisting of several thrusters. 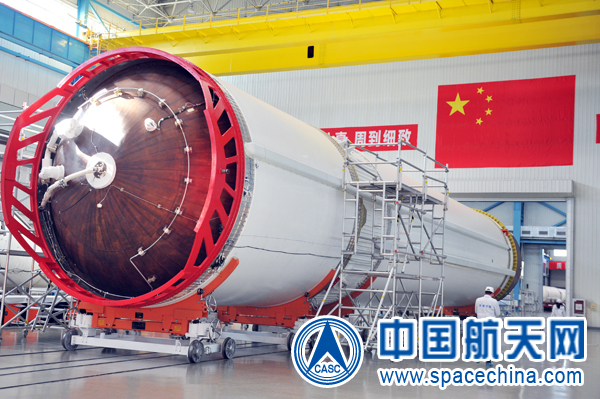 Two different fairings are used on the Long March 5 rocket. The Low Earth Orbit version, CZ-5B, features a stretched fairing 20.5 meters in length under which large spacecraft such as Space Station modules can fit with ease. 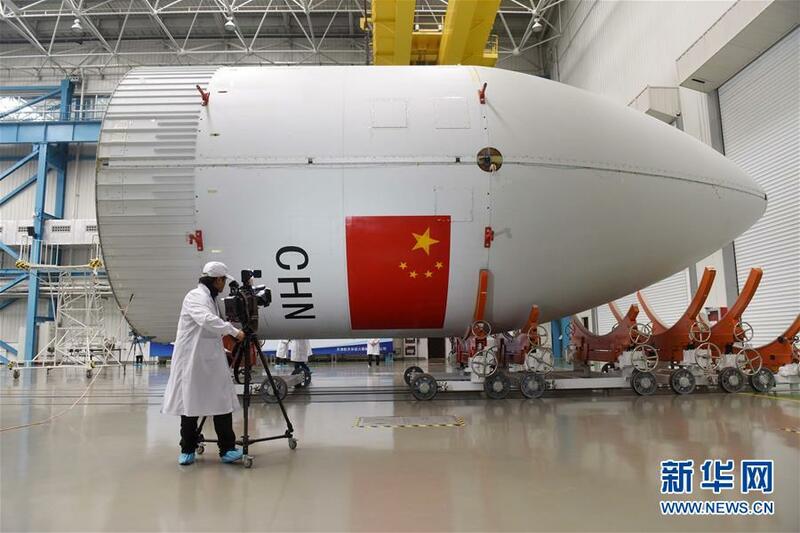 The CZ-5 variant employs a shorter fairing that is 12.27 meters long, providing sufficient space for large Geostationary Communications Satellites as well as four Beidou-3 MEO Navigation Satellites stacked atop a YZ-2 upper stage. 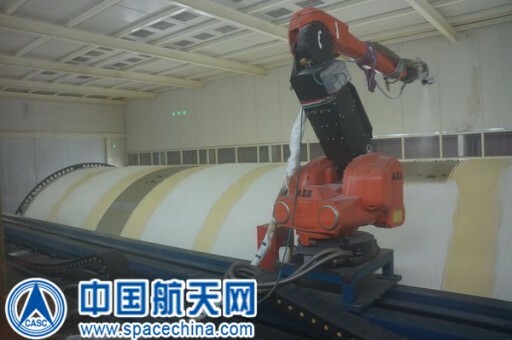 Both fairings are 5.2 meters in diameter with an inner payload envelope diameter of 4.5 meters.